GERTEIS specialise in the design, development, and production of premium roller compactors for the pharmaceutical, chemical, and food industries. With its innovative technological capabilities for design, development, manufacturing, and process optimisation, GERTEIS guarantees the optimal solution for your dry granulation needs. Gerteis always provide you with the optimal dry granulation solution. Its machines are suitable for the pharmaceutical, chemical, and food industries and can be customised for your individual setup. Gerteis’ flagship roller compactor, MACRO-PACTOR®, is designed and engineered for development, pilot projects, and full-scale production. With the optional clean-in-place (CIP) / wash-in-place (WIP) cleaning, press roller cooling or heating, and different press roller surface designs, you can be sure of an optimised solution for your dry granulation needs. With its capacity of 10g/trial up to 100kg/hr, the MINI-PACTOR® is the ideal roller compactor for laboratory development. It also handles pilot projects and small-scale production easily. Scale-up to full-size production is a breeze due to the company’s harmonised PACTOR® designs. Some of the options available are WIP / CIP cleaning, press roller cooling / heating and different roller surface designs. Gerteis’ high-end roller compactor ULTRA-PACTOR® reaches a containment level of <0.1µg/m³. The ULTRA-PACTOR® guarantees optimal protection for the operator against highly active and dangerous substances. By renting a Gerteis unit, you can test the company’s dry granulation equipment and see for yourself how well the machine works before making a definite purchase decision. Gerteis will also provide training for your operators so they can immediately discover the advantages of our roller compactor. Renting a unit is risk-free, as the company will fully credit your rental payments towards the purchase price if you decide to buy the machine within twelve months from the start of rental. 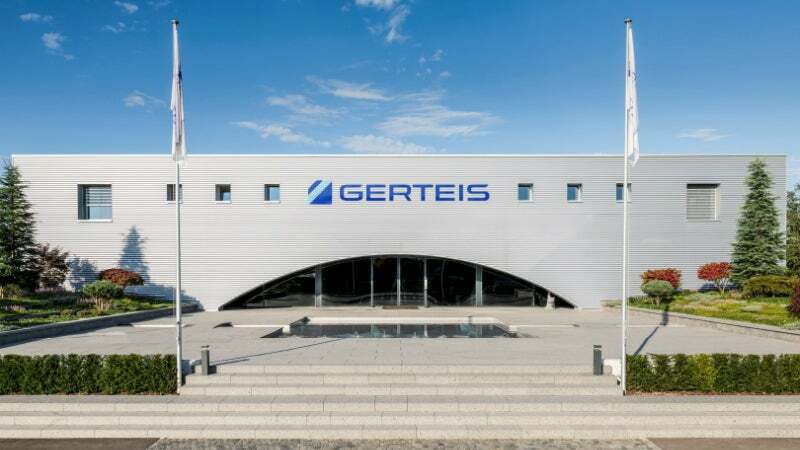 Gerteis’ highly skilled staff can provide you with in-depth knowledge and know-how to not only optimise your product throughput and overall product quality, but also save you a considerable amount of money by supporting the development of that all-new product you wish to put on the market. In addition, the company conducts presentations and hands-on seminars to train your staff on all aspects of dry granulation and to maximise productivity output. Contact Greiner using the enquiry form to discuss your dry granulation application. Nucleo Life Sciences is a modern and state-of-the-art contract development and research lab (CRO) based in San Rafael, CA. While not every formulation can be granulated on a conventional roller compactor, the GERTEIS® roller compactor has several unique patented technologies, which allow for a far greater range of formulations to be dry granulated successfully compared with conventional roller compactors. The Macro-Pactor is a roller-compactor, which provides sophisticated real-world calibration for projects from pilot to full-scale production. With a capacity from 10g to 100kg/h per trial, this roller compactor is suited to laboratory use, while also handling pilot and small-scale production. The Polygran is a fully instrumented development pilot plant for clinical and full-scale production from 500g to 300kg/h. It has a wide range of technological benefits, including validated gap and force measurement. The Ultra-Pactor is a high-end roller compactor, which can handle capacities of <0.1µg/m³, with a throughput of 400kg/h. Roller compaction expert Gerteis® will return to the international Interphex 2019 exhibition in New York to showcase its high-performance roller compaction solutions. This year's PMEC event has opened in Noida, Delhi, India. Roller compactor expert Gerteis® has announced it will return to the international prestige CPhI P-MEC India, which is scheduled from 12 December to 14 December 2018 at the IEML Greater Noida. Roller compactor expert Gerteis® has announced it will return to the Pharmtech Moscow. Gerteis has announced that its roller compaction seminars have been a great success. Gerteis has announced a successful completion of its first seminar. Dry granulation expert Gerteis® will return to the international high-prestige Interphex Japan 2018 exhibition in the Tokyo Big Sight venue to showcase its high-performance roller compaction solutions. Dry granulation expert Gerteis® has announced it will return to the international high prestige ACHEMA exhibition in Frankfurt this year to showcase its high-performance roller compaction solutions. Gerteis Maschinen + Processengineering AG is proud to celebrate its 30th anniversary of providing the pharmaceutical community with high-quality roller compactors. Gerteis is heading to the US's prestigious INTERPHEX expo in New York for the tenth year in succession to showcase its cost-effective roller compaction solutions.